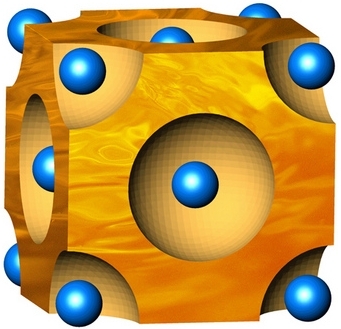 In this diagram, the blue spheres represent selenium atoms forming a crystal lattice. The orange regions in between the atoms represent the copper atoms that flow through the crystal structure like a liquid. This liquid-like behavior is what gives the selenium-copper material its unique thermoelectric properties. PASADENA, Calif.—In the continual quest for better thermoelectric materials—which convert heat into electricity and vice versa—researchers have identified a liquid-like compound whose properties give it the potential to be even more efficient than traditional thermoelectrics. Thermoelectric materials have been used to power spacecraft ranging from Apollo to the Curiosity rover now headed for Mars. Recently, however, scientists and engineers have been turning to these materials to use wasted heat—released from automobiles or industrial machinery, for instance—as an efficient energy source. They have also proposed using these materials to create more efficient heating systems in electric cars or even as new ways to exploit solar power. In identifying this new type of thermoelectric material, the researchers studied a material made from copper and selenium. Although it is physically a solid, it exhibits liquid-like behaviors due to the way its copper atoms flow through the selenium's crystal lattice. "It's like a wet sponge," explains Jeff Snyder, a faculty associate in applied physics and materials science in the Division of Engineering and Applied Science at the California Institute of Technology (Caltech) and a member of the research team. "If you have a sponge with very fine pores in it, it looks and acts like a solid. But inside, the water molecules are diffusing just as fast as they would if they were a regular liquid. That's how I imagine this material works. It has a solid framework of selenium atoms, but the copper atoms are diffusing around as fast as they would in a liquid." The research, led by scientists from the Chinese Academy of Science's Shanghai Institute of Ceramics in collaboration with researchers from Brookhaven National Laboratory and the University of Michigan, as well as from Caltech, is described in a paper recently published in the journal Nature Materials. A thermoelectric material generates electricity when there is a temperature difference between one end of the material and the other. For example, if you place a thermoelectric device right next to a heat source—say a laptop battery—then the side closest to the battery will be hotter. The electrons in the hot end will diffuse to the cool end, producing an electric current. A good thermoelectric material must be good at conducting electricity but bad at conducting heat. If it were good at conducting heat, the heat from the hot end would move to the cool end so fast that the whole material would rapidly reach the same temperature. When that happens, the electrons stop flowing. One way to improve thermoelectric efficiency, then, is to decrease a material's ability to conduct heat. To that end, researchers have been developing thermoelectric materials with a mix of crystalline and amorphous properties, Snyder says. A crystalline atomic structure allows electrons to flow easily, while an amorphous material, such as glass, has a more irregular atomic structure that hinders heat-carrying vibrations from traveling. These heat-carrying vibrations travel via two types of waves. The first type is a longitudinal or pressure wave, in which the direction of displacement—in this case, the jiggling of atoms—is the same as the direction of the wave. The second type is a transverse wave, in which the direction of displacement is perpendicular to the direction of the wave, like when you shake a jump rope up and down, resulting in waves that travel horizontally along the rope. In a solid material, a transverse wave travels because there is friction between the atoms, meaning that when one atom vibrates up and down, an adjacent atom moves with it, and the wave propagates. But in a liquid, there is minimal friction between the atoms, and a vibrating atom just slides up and down next to its neighbor. As a result, transverse waves cannot travel inside a liquid. Ocean waves are different because they have an interface between the liquid and the air. The team found that because heat-carrying vibrations in a liquid can travel only via longitudinal waves, a material with liquid-like properties is less thermally conductive. Therefore, a liquid-like material that's also good at conducting electrically should be more thermoelectrically efficient than traditional amorphous materials, Snyder says. In the case of the copper-selenium material that the researchers studied, the crystal structure of the selenium helps conduct electricity, while the free-flowing copper atoms behave like a liquid, damping down thermal conductivity. The efficiency of a thermoelectric material is quantified using a number called a "thermoelectric figure of merit." The copper-selenium material has a thermoelectric figure of merit of 1.5 at 1000 degrees Kelvin, one of the highest values in any bulk material, the researchers say. NASA engineers first used this copper-selenium material roughly 40 years ago for spacecraft design, Snyder says. But its liquid-like properties—which were not understood at the time—made it difficult to work with. This new research, he says, has identified and explained why this copper-selenium material has such efficient thermoelectric properties, potentially opening up a whole new class of liquid-like thermoelectric materials for investigation. "Hopefully, the scientific community now has another strategy to work with when looking for materials with a high thermoelectric figure of merit," Snyder says. In addition to Snyder, the research group includes Caltech graduate student Tristan Day. The other authors on the Nature Materials paper, titled "Copper ion liquid-like thermoelectrics," are Huili Liu, Xun Shi, Lidong Chen, Fangfang Xu, Linlin Zhang, and Wenqing Zhang of the Chinese Academy of Science's Shanghai Institute of Ceramics; Qiang Li of Brookhaven National Laboratory; and Citrad Uher of the University of Michigan. Support was provided by the National Natural Science Foundation of China, the Shanghai Science and Technology Commission, the CAS/SAFEA International Partnership Program for Creative Research Teams, the National Basic Research Program of China, the U.S. Department of Energy, and the Air Force Office of Scientific Research's Multidisciplinary Research Program of the University Research Initiative.